A man has been arrested in connection with the Real IRA murders of two soldiers at an Army base in March. 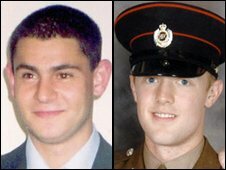 Sappers Patrick Azimkar and Mark Quinsey were shot dead outside Massereene barracks in Antrim. The two young soldiers were the first to be murdered in Northern Ireland in 12 years. The 47-year-old, who was arrested in Belfast on Tuesday, is also being questioned about five attempted murders during the attack. The arrest was made by detectives from the PSNI's Serious Crime Branch. Two men have appeared in court charged with murdering the soldiers.